Ongava Game Reserve sits just south of Etosha National Park in northwest Namibia. The private reserve covers more than 74,000 acres that include rolling hills and mopane bush. As we drove from the airstrip to camp the landscape looked familiar, but not to anything we had seen in Namibia. Rather the rolling hills, dusty earth and rustling mopane bush reminded me of Hwange National Park in Zimbabwe. As our open safari vehicles pulled into camp the beauty and unique qualities of Ongava Tented Camp became apparent. Ongava Tented Camp is unique for many reasons, not the least of which is comfort. Eight safari tents are built on wooden decks that include large verandas. Our spacious home for the next three nights was tent #2 complete with a writing table, mosquito-netted bed, en suite bathroom and shower. Oh, and there was also a private (at least from other guests if not the wildlife) outdoor shower just beside the en suite bathroom! An outdoor shower in the warm afternoon when returning from a dusty game drive is not to be missed. Some tents are fitted with solar geysers (pronounced gee-zers – solar water heaters to us) and others, like ours, use a donkey to make hot water. Don’t worry, no equines are used in the process. Donkeys are wood-fired water heaters used throughout Africa in remote settings. The one outside our tent was made of rock and lent a rustic feel to the camp. Talk of gee-zers and donkeys added to the charm of Ongava. The open-air lodge is built just beside a waterhole used by a wide variety of wildlife on the reserve. It is possible to walk to the bar, order a drink, then sit, with gin & tonic in hand, beside the swimming pool without ever taking your eye off the waterhole. We ate all of our meals in the open-air lodge. In October the weather is cold at night, but mornings are pleasant, afternoons very warm and evenings balmy. Every meal brought delicious choices to the dining table and a parade of wildlife at the waterhole. We saw elephants, giraffe, rhinos, zebra, waterbuck, springbok, impala and baboons cautiously approach the water to drink as we relaxed. Regardless of the time of day animals came to the waterhole. They approached by species, usually in groups, and took turns quenching their thirst. Lions, of course, didn’t share the waterhole with any other species. When the lions were at the waterhole there were no other animals to be seen. The night before we arrived two unruly male elephants came through the area damaging trees. It was a shame as they appeared to destroy the few trees with any green leaves remaining in the dry season. 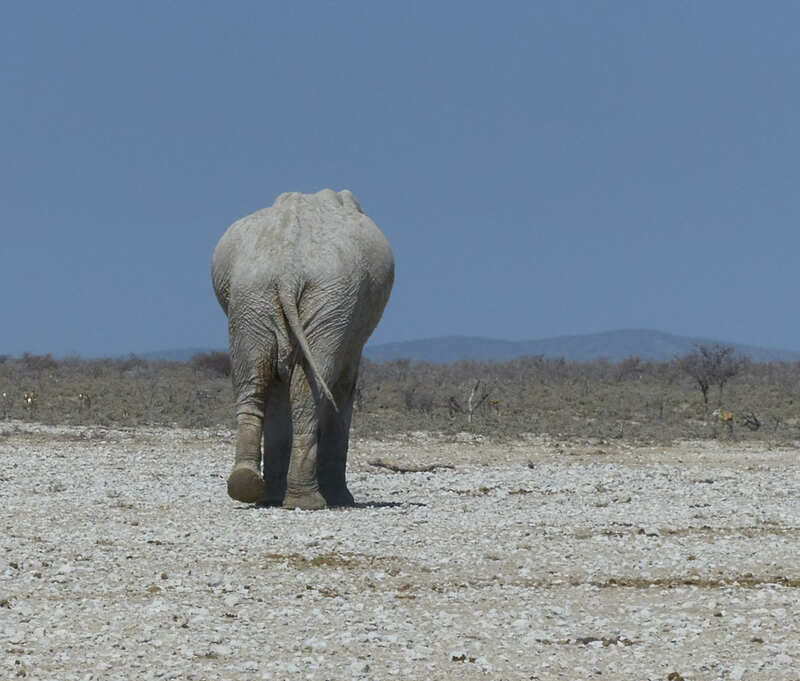 This behavior is similar to what we saw in other parts of Africa, but unlike the behavior of desert-adapted elephants in Damaraland that only push over trees that have already died. Size matters, to me, in the enjoyment of a safari camp. I am not a fan of large camps where multiple groups come and go. They tend to be noisy and hectic. Ongava Tented Camp accommodates only 16 guests which makes for a relaxing experience. Our group of 14 essentially had Ongava Tented Camp to ourselves. Our orientation at Ongava Tented Camp included a warning that lions are present in the reserve. It is a serious matter (humans are relatively slow and therefore easy prey for a hungry lion) and meant we were not free to walk around camp in the evening by ourselves. It was necessary for us to be escorted to our tents at night in groups with an armed guide. We were not allowed to leave our tents at night and could only leave in the morning after a camp guide notified us it was safe to do so. Not since a safari several years ago in Hwange National Park had we been escorted by rifle-carrying guides. On almost every safari there is one moment when even the experienced guides fall quiet, take out their cameras and watch. One morning we experienced just such an occasion. We had been given the all-clear by a guide and left our tent early for a cup of coffee in the lodge. As we walked into the lodge we noticed several guides with their attention focused on the waterhole. We noticed a pride of lions drinking. 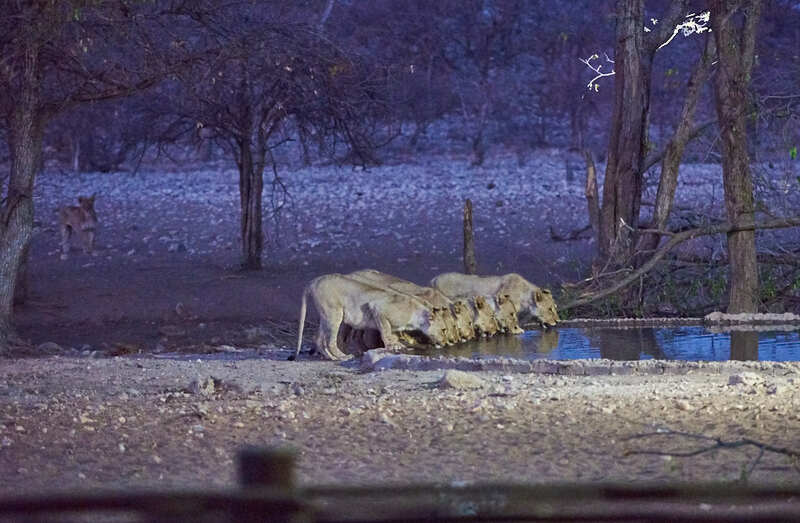 In whispers the guides told us this was not the usual pride that frequents the waterhole. It was a new pride which meant there was the potential for conflict between this new pride and the established one. I have often wondered since that time how these two lion prides are coexisting, or if they are. Note to self: never leave your tent without your camera. You never know when a new pride of lions will show up in camp. Photos taken with your phone in the early-morning light are not the best quality. Our wildlife sightings were not limited to the waterhole in camp. We saw lots of birds and animals in Ongava during the morning and evening game drives. This part of Namibia is similar to the other parts of Africa we’ve visited in terms of terrain and numbers of wildlife. The bush and open spaces are dotted with herds of black-faced impala, springbok, wildebeest and waterbuck. We saw surprising numbers of birds, often congregated around the waterholes throughout the reserve. I never tired of watching the animals. Mostly they seemed bored with our presence, but always kept an eye on us. Just about every day we have spent on safari in Africa has ended with a sundowner. Safari vehicles gather around in a location with a spectacular view of, you guessed it, the setting sun. But there is also the opportunity to talk about the day’s animal and bird sightings. Drinks are poured and appetizers passed. Gin and tonic is the essential libation; wine just doesn’t do it for me as I watch the sun slip over the edge of the African continent. But, in Ongava Game Reserve, one evening before we got to the gin and tonics we were treated to a sighting of white rhinos. Not only that, we were able to get out of our safari vehicle to approach them – at a safe distance. It is a very big deal to be able to get out of your safari vehicle in the bush. We were never allowed to do so in Botswana, Zambia or Zimbabwe unless we were at a lunch or tea stop (so delicately called tea & pee). The guides always did a safety check before we were allowed to exit the vehicles. Before setting foot outside of the safari vehicle our guide gave us solemn instructions to stay single-file, close behind him and to keep quiet. Rhinos have poor eyesight but have an excellent sense of smell and hearing. I kept close on the heels of Rio, who was armed with a rifle, as he carefully chose our path through the bush toward the rhinos. I can’t tell you how thrilling it was to be out of the vehicle, walking through the bush approaching these enormous animals. I could barely take my eyes off the rhinos long enough to take photos. I wanted to stand there forever, in silence, admiring them. Needless to say our sundowner that evening was quite animated. I wasn’t the only one who got an adrenaline rush “tracking” the rhinos. Really, I could have spent many more evenings like this, but I am thankful for this one experience. That evening during dinner, just as my entrée arrived, three white rhinos approached the waterhole for a drink. We had a second opportunity to watch these amazing animals. My dinner was cold by the time I finished it that evening. No complaints, though. Black rhinos also inhabit the reserve, but we only managed to see an indistinct outline of the animals through thick brush from our safari vehicle. We saw many sets of rhino tracks, so we knew they were all around us. They probably had many more sightings of safari vehicles than we had of black rhinos. Score one for the black rhinos. Ongava Tented Camp is only a short drive from the Andersson’s Gate entrance to Etosha National Park. The park takes its name from the pan it surrounds which is mostly dry except for infrequent flooding in the rainy season and a few natural springs. Flamingos gather to breed here after the summer rains. 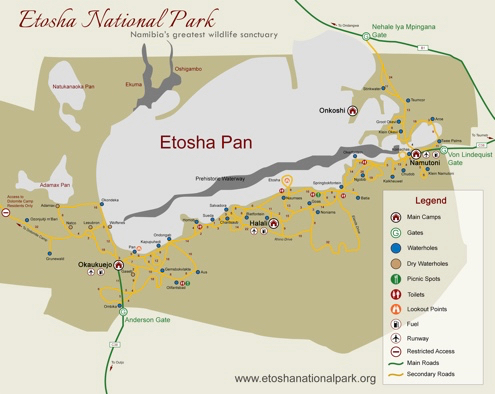 The pan measures roughly 80 miles by 30 miles and occupies 25% of Etosha National Park. Etosha means great white place which refers to the white color of the pan due to its mineral content. An alternate meaning is place of dry waters referring to the mirage effect over the pan. Both are apt descriptions, but especially the second, as temperatures can exceed 120º F on the pan. Wildlife mostly lives on its edges. The park was established in 1907 as a reserve that reached to the Skeleton Coast in some areas. It covered over 100,000 square kilometers in its original configuration, but was reduced to its current 20,000 square kilometers in 1970. The reserve was originally established to protect habitat and the animals from extreme hunting pressure. Wildlife in the park was reduced significantly by a variety of factors through the 1980s but conservation efforts have resulted in increasing numbers of wildlife in the park. The park contains Namibia’s largest concentration of wildlife which, in the dry season, gathers around permanent waterholes. During the rainy season the animals tend to be more dispersed throughout the park. Roads within the park are well maintained and link this series of waterholes along the southern edge of the pan. We ventured into the park only once, leaving large portions of the park to be explored on another trip. Whenever we travel we can’t help but look for locally-made wines. It is more difficult in some locations than others to find them, that’s no big surprise. When we were in Windhoek at the beginning of our Namibia vacation we visited a wine shop and found a delicious Namibian wine which we enjoyed at Kulala Desert Lodge. We were unable to find any Namibian wines at Damaraland Camp. Our luck changed at Ongava Tented Camp where we found three Namibian wines. One evening several of us joined together to purchase and share the wines with our group over dinner. What an evening … delicious Nambian wine, elephant viewing from the dinner table and a delicious meal of squash soup, roast lamb and chocolate cake. A few notes on the wine we tasted follow. 2013 Thonningii Syrah – herbaceous and fruity with smooth tannins. Thonningii is produced in the Otavi Valley, about 125 miles east of Ongava Game Reserve, by Dr. Bertus Boshoff and his wife Ebby. 2014 Neuras Namib Red Blend — red and dark fruit with nice depth of flavor and grippy tannins. This wine is a blend of Shiraz, Merlot and Petit Verdot and is produced not far from the site of our first camp, Kulala Desert Lodge, near Sossusvlei where we enjoyed a bottle of the Neuras Shiraz. 2014 Erongo Mountain Winery Etosha Blend — spicy red fruit with significant tannins. This blend of Shiraz and Cabernet Sauvignon is made by Erongo Mountain Winery in Omaruru, about 3 hours’ drive south of Ongava. Ongava Tented Camp was the final camp in our Namibian adventure. For this trip. We visited three camps in distinctly different parts of of this vast country. In addition to the time we spent out in the wide open spaces of Namibia we also spent time in the cities of Windhoek and Swakopmund. Each location was beautiful and we thoroughly enjoyed the time we spent in Namibia. There are, however, still parts of this beautiful country left to explore. We are already planning to return. What can I say other than WOW! I absolutely love reading about your journey. Hope to have my own some day. I’ve never considered going to Africa…until now. Looks like an amazing experience. A wonderful post! Thank you so much, Martin. I hope you do go. It will be memorable.